There'll be more blood, more monsters, and more gross tendril attacks in Prototype 2. Prototype 2 is still in a pre-Alpha phase, but Activision demoed it for us at E3 2011 anyway. For a pre-Alpha game, it looks like a lot of brutal fun that'll add to the Prototype formula. Prototype 2 moves Alex Mercer into the role of antagonist, placing Sgt. James Heller squarely in his place as hero. Heller blames Mercer for the death of his family, and gives in to accepting the curse of Mercer's powers to avenge them. The game takes place in three separate zones. The green zone is closest to normal, but is under oppression by Blackwatch special forces. Yellow is under quarantine and looks something like the slums from District 9, with Blackwatch performing strange human experiments there. Red is where Mercer resides, and is generally considered to be beyond help. Entire skyscrapers are encased with biological constructs. The demo opened in the green zone with Blackwatch forces brutally murdering a group of innocent civilians that wouldn't evacuate a cordoned-off area where a strange creature was found. Heller takes the appearance of a Blackwatch soldier so he can question the scientists investigating the creature. There are multiple ways to solve this situation, but our demoer did it by creating a distraction with a tendril bomb, and then moving on to the scientist and bashing his brains out to absorb his memories. A second mission featured the Hunter mechanic, which allows Mercer to ping the environment (like radar) to locate a specific person. One method of acquiring these missions is through finding Blackwatch command trucks where Heller can hack into live operation folders and try to work out the story of the organization and its ties to Mercer. Players can pick which they take on at any time. Moving around the city is easier than ever, with Activision showing a system that looked like super-parkour. Heller soars up the sides of buildings and flips across rooftops with ease. It looked like a lot of fun just to make your way through the city. As Heller grows, players will earn mutations that might make his air dash or other customizable abilities more powerful. There are also lots of other fun things for players to do. For example, when attacking a tank you can weaponize its attached rocket launcher, rip it off, and fly up into the air in slow motion as you blow the tank up with its own weapon. Lairs are a new mechanic that are basically like "underground treasure chests." The one we were shown was filled with a bunch of wild infected human-type enemies, but they were just scenery compared to the real lair threats. A few spiky dog-types came out to team-up on Heller, who slashed them to pieces with his close-range tendril blade. Once they were all sliced in half, a pair of huge Juggernauts emerged as the bosses of the lair. Activision said it's attempting to improve enemy tells in important fights like these so players can use skill in battle rather than relying on luck or a bumrush. These tells will seriously matter in fights with one major foe that was teased at the end of the demo named "Tiny." He wasn't tiny. He was half the size of a skyscraper, with one bladed hand and another mutated fist the size of a silo that it could barely lift itself. We weren't able to see how Heller takes this thing down, but you can bet the act will be headlined by a lot of gross liquid that'll shoot out in the process. 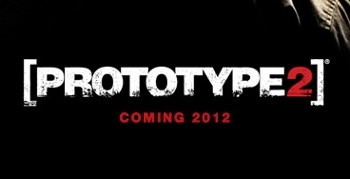 Prototype 2 is scheduled to hit the PS3, Xbox 360, and PC in 2012.